IMPORTANT NOTE: Registration for the New England Patriots Second Chance Drawing is separate from the Mass Lottery VIP Players Club and your log-in information for the Players Club will not allow you to submit entries. 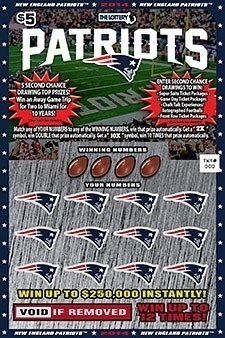 Please take a minute to register an account in order to be eligible for the New England Patriots Second Chance Drawing. I acknowledge my agreement with the TERMS OF SERVICE policy and understanding that for the purpose of submitting entries into second chance drawings I will access my second chance entry account from within the boundaries of the Commonwealth of Massachusetts.